To me, these are the crown jewels of collecting Ultraverse comics. I have no idea how many of these were printed, but I don’t think the number is too high. 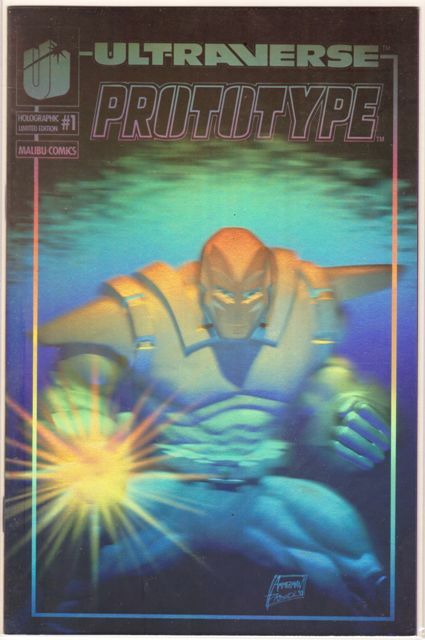 When they first launched the Ultraverse, seven of the first series (Exiles, Freex, Hardcase, Mantra, Prime, Prototype, and Strangers) had variant silver hologram covers for the No. 1 issues. I suppose these were mainly dealer incentives, but I remember seeing these going for $100 or more at comic cons back then. The official print run for each was 5,000, but I couldn’t tell you if all of those made it into circulation. 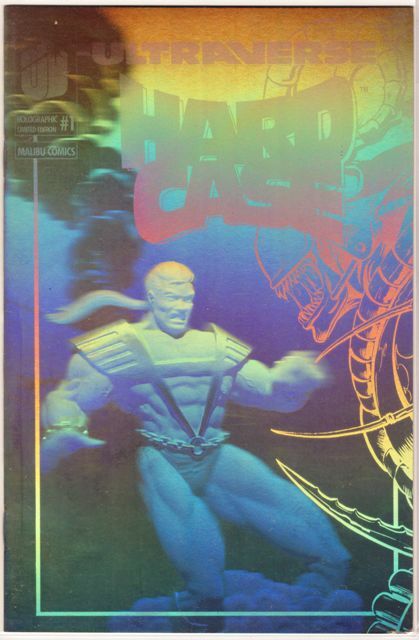 But the gold hologram covers … I never saw one of those until a few years ago on eBay. I don’t have the data to back this up, but my hunch is that these are really freaking rare. 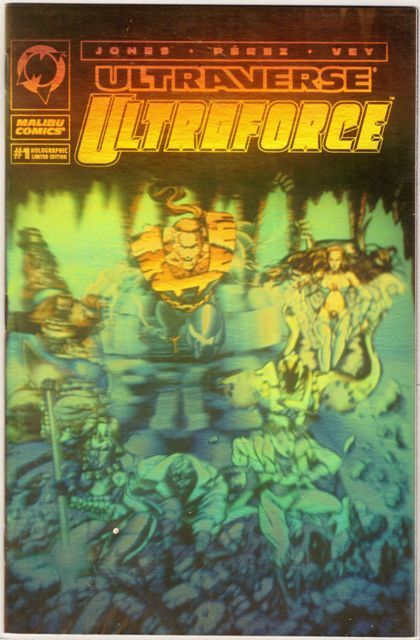 But since nobody seems to care much about collecting Ultraverse anymore, you can still get them relatively cheap. I picked up a Prime gold when I thought I was buying a silver for $5 on eBay. 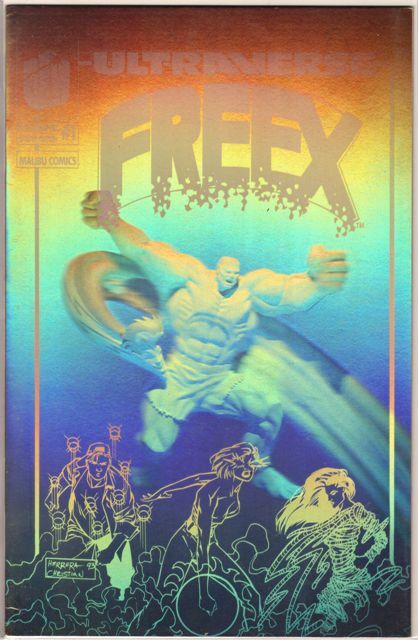 I bought a Freex gold for $8 from Mile High Comics. It took me several years to put together a full set; the most I paid was around $20. I saw a full set of all seven go for about $150 a couple of years ago (all of the silvers were included in that auction). Here are the seven. I also included the Ultraforce gold, although it is a different type of gold hologram and did not have a silver counterpart. I think they are pretty common (official print run was 5,500); I bought 20 of them from Mile High for $32 a few years back. Click on the image to see a larger picture, but these things don’t really scan in all that well. Help me out if you might know how many of these were made, or what happened to them. 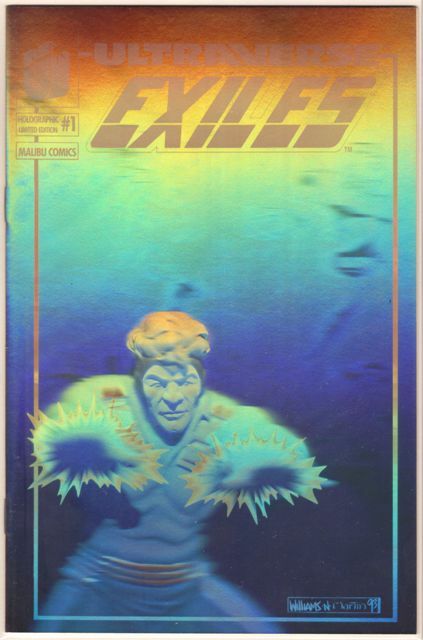 This entry was posted on Thursday, April 28th, 2011 at 8:40 pm	and tagged with Exiles, Freex, Hardcase, Hologram covers, Holographic covers, Mantra, Prime, Prototype, Strangers, Ultraforce, Ultraverse and posted in Hologram covers, Premium books. You can follow any responses to this entry through the RSS 2.0 feed. I was big on collecting Ultraverse when it first came out up until the Marvel abomination. The Golds were originally intended for release as a 1 year anniversary item, but due to a problem in shipping alot of them were damaged. They weren’t intended on being released for that reason as Malibu had high standards in publishing Ultraverse material. When Marvel bought the company and a majority of the Malibu staff was let go the story is that the golds went with some of the people laid-off and that is how they got unto the market. The estimated numbers of them range anywhere from 250-500 copies as the damaged ones were destroyed. I know exactly what happened to many of the gold books. When I was regularly corresponding with Tom Mason, he said that after the lay off, the staff could take whatever they wanted… So they did. 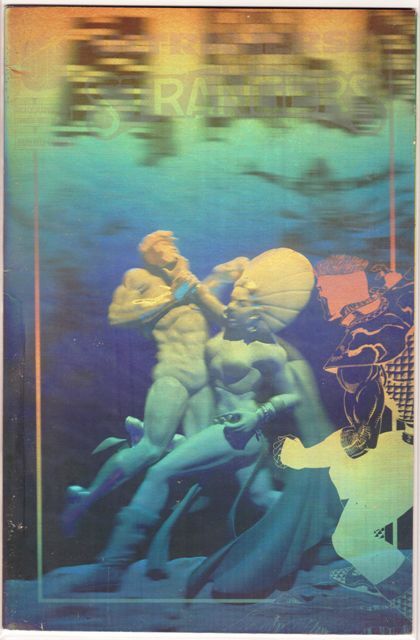 Any hologram books or other material that was laying around was taken by staffers and is either still in collections or sold off as Tom was doing for a while. But he said that everything was not claimed and was then destroyed. This brings me to think that the already assumed low print numbers are now even lower for ‘existing’ copies. This is as I know it from Tom Mason. 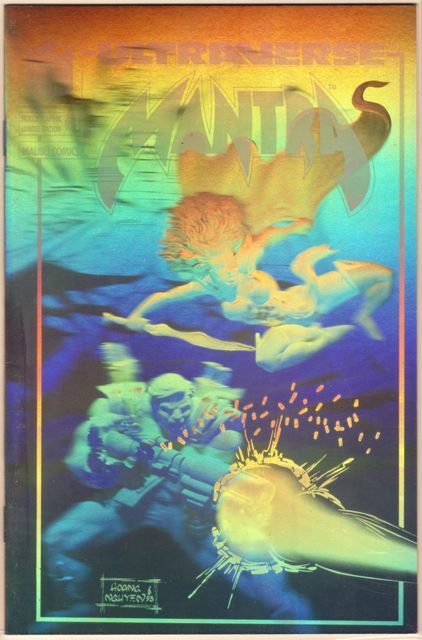 As I said,we corresponded for a while but at one point he had to stop talking about things Ultraverse because he had been interviewed about this very subject in great detail and it was to appear in some book… Our communication slowed down a great deal after that and I wish that I had saved all the lengthy emails. My girlfriend Marissa would love your site, I have sent her an email with your URL. Thanks, Mr. Express! Does Marissa enjoy wearing pants? I was wondering if you had a gold prime hologram available for sale? I have been working on an Action Comics #1 homage collection and can not find a gold Prime issue. 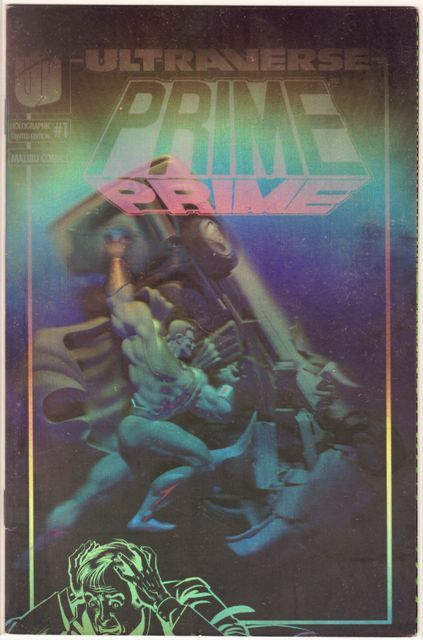 I have around 72 issues in this collection and purchased a silver Prime variant issue last year from a comic book store online.